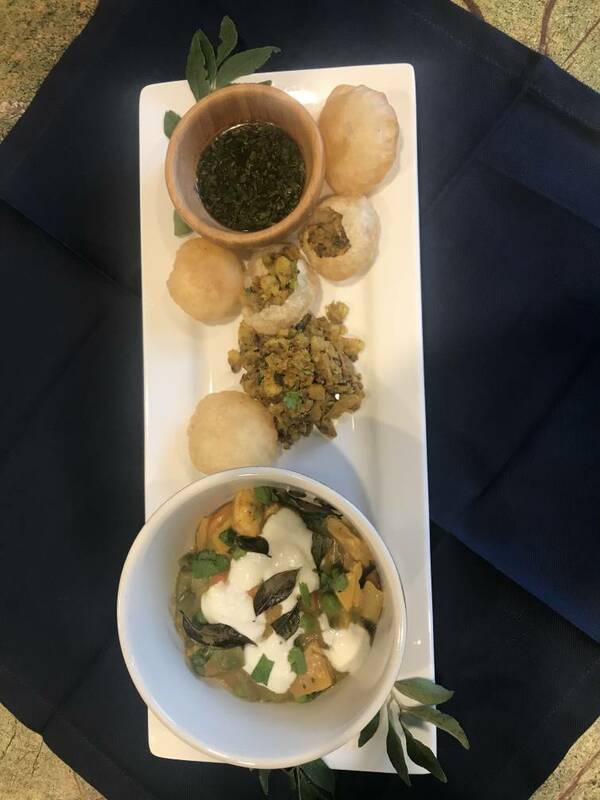 Our version of a deconstructed chicken pot pie with an Indian twist feature the potpie mixture in a bowl and puris stuffed with a potato/spice mixture and pani poured over the top. It was delicious. KELLEY SAYS: One of the exciting, or scary, things about doing this monthly feature for the paper is that we don't always know how it will turn out. BARRY SAYS: Do you mean sometimes we do? KELLEY: Well, I'd like to think so. Anyway, the whole point of these recipes really is to try something new, and this is one of those meals. I've made chicken potpie before using biscuits on top of the mixture and thought I might try adapting that giving it an Indian twist. I found some recipes for a pani, which is a salty, herby sauce that we poured over a potato-filled puris, which is like a delicate Indian pastry. You take off the top and stuff it with a filling and then pour a little of the pani into it. BARRY: I can already hear people saying it sounds too complicated, but it was delicious. KELLEY: It's a little trickier than some dishes, but that's what we like, right? It might be one of my new favorite things. BARRY: They were really good, and served with the spicy, rich, thick curry-flavored soup, it was very good. KELLEY: I bought the puris at the local Indian market. They are very delicate and about the size of a golf ball. I made the potato filling and the pani and then started on the potpie. I would call this a deconstructed potpie. I served the soup in a bowl and had the puris and pani on the side so we could make and eat them and they wouldn't get soggy. Photo by Barry Courter /Times Free Press. Mix all ingredients, and adjust seasonings to taste. Heat oil or ghee over medium heat. Add cumin seeds, and cook until they begin to pop. Add onion, pepper and potatoes. Cover, and cook until soft, about 20 minutes. Stir often to prevent sticking to the pan. Add water as needed. Add remaining ingredients, except cilantro, smashing potatoes with back of spoon. Taste, and adjust seasonings as needed. Add cilantro. Set aside. To assemble, take a small section of the puri off, and stuff a small amount of potato inside. Drizzle a bit of pani over the top, and plop the whole thing into your mouth. Put a little oil on baking sheet. Place chicken on baking sheet, and sprinkle with spice. Cook for 10 minutes. Remove from oven, and flip chicken. Sprinkle again with spice, and return to oven for another 10 to 15 minutes. Remove and let cool. Season with salt to taste. Cook about 20 fresh curry leaves in a little oil to crisp. Drain on paper towel. Use them as a garnish. With more oil, saute the carrots, onion, celery and jalapenos. Cook till soft. Add chicken to the mix. Add a little water to help steam the carrots. Cook until carrots are done, about 20 minutes. Add one cup frozen peas. Turn off heat. In a separate pot, make a roux of the butter and flour until incorporated. Add chicken broth and water, and cook until thickened. Add turmeric powder, cumin powder, garlic powder and curry powder. Add chicken mixture and chopped cilantro. Serve with curry crisps and a dollop of yogurt. Serve the soup in a bowl with puris and pani on the side so they don't get soggy.